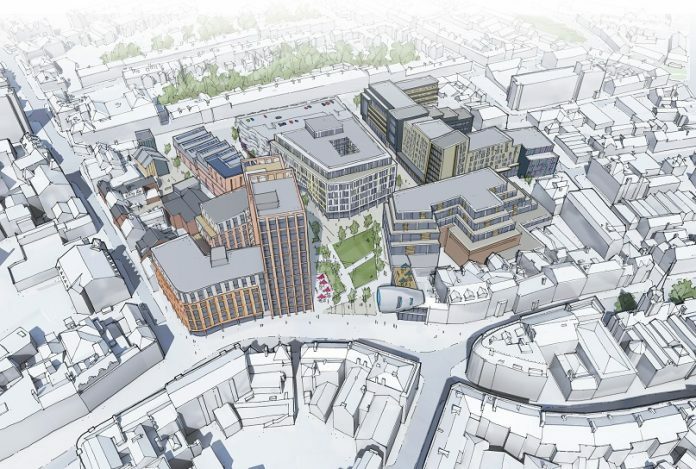 Proposals for the development of the Becketwell area of Derby are to go on show at a public consultation event, which is taking place in Derby’s intu centre. St James Securities (SJS), a privately owned Leeds-based property developer, is working in partnership with Derby City Council to deliver the comprehensive regeneration of the Becketwell area. This will include a mix of homes, workspace, hotel, retail and leisure uses, along with an exciting new public square for the city. The smaller building will house 90 apartments over a retail store. In response to local feedback, this building has been designed to retain the curve of the existing buildings to the Victoria Street frontage. Both buildings will have rear decked car parking. Commenting on the consultation event, Paul Morris, director of St James Securities, said: “Since the closure of the former Duckworth Square Shopping Centre in the late 1980’s, a number of proposed developments have been promoted across the site. These range from supermarkets to health-hubs, offices to an ice rink and an urban entertainment centre. “We’re very excited to showcase the proposals that our project team alongside Derby City Council have been working on over the past 12 months.